Today as part of The SIT's girls day 4 challenge we are supposed to share with our readers a fall craft or an autumn recipe. Today, I'm going to share a fall craft idea with you! I started this apple growth chart back when daughter started Preschool at age 3 - this year she entered into the First Grade. 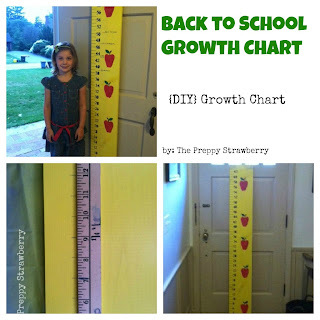 She will eventually outgrow this ruler by the time she hits middle school but it's definitely a keepsake she can use when she has children one day. 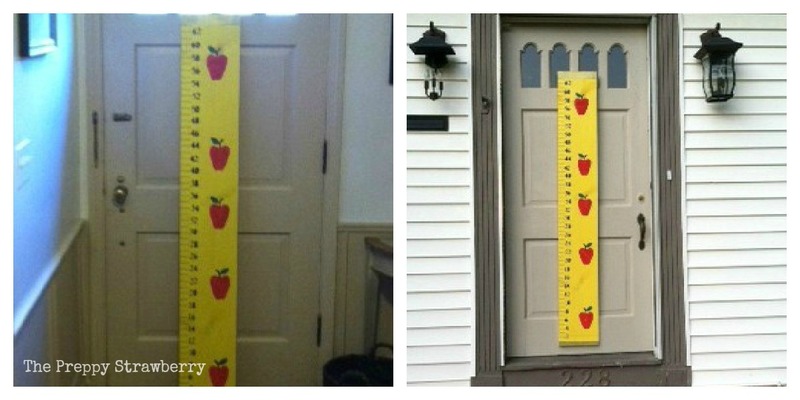 All I did to my board is cut it to work with my front door - so size will vary as to how tall you want your growth chart to be. I bought yellow spray paint and painted the front of my board and my sides yellow. I let it dry completely and then I did a second coat. Sorry, I have no pictures of the actual stenciling of the numbers and apples but all I did was I created a stencil using my cricut for numbers and my apples. I traced the numbers in pencil first and then went back and filled in with the sharpie marker. 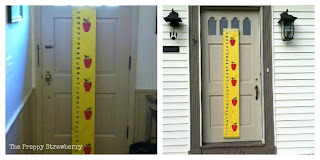 The apples I sponged on using my stencil and just random spaced the apples on the growth chart. Once the board was dry my husband drilled a screw in the back so I could hang it on the front door hook. Using the Gold Spray paint - You will use this to create the ruler edge at the top and the bottom of the ruler. I used painters tape to help create the straight edge line for my gold spray paint. This is awesome!! Not too hard to make! I'd love you participate in my Pin Me Linky Party. I allow up to 3 links each week! Thanks for linking up! I am now following via FB, Twitter, & Pinterest!